Parchment : 1 sheet 73cm x 59cm with 7 wax seals, signatures, and revenue stamps. Includes schedules at bottom of sheet. 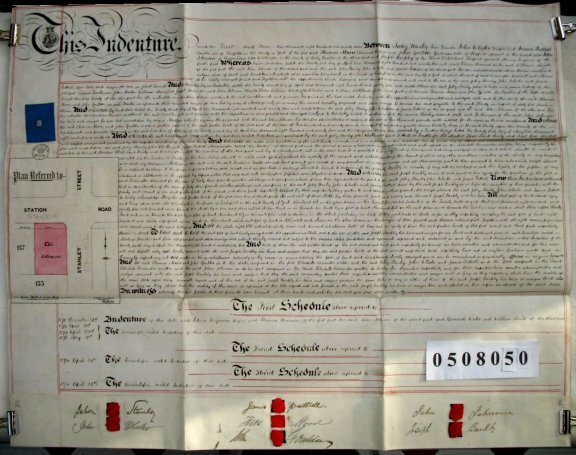 The document begins by reciting that in 1874 a plot of land at Low Wincobank, Parish of Ecclesfield, Yorkshire, was purchased by Jabez Stanley, John Wheeler and James Puttrell, who were acting as Trustees of the Meadow Hall Land Society. Since then the land has been mortgaged to both the Fifth Norfolk Building Society and to John Johnson. Joseph Barkby is now buying one lot of 830 square yards for £63/19/7d (which is part of the original plot). It lies on the corner of Station Road and Stanley Street.